Technology spending represents an ever-growing portion of total corporate expenditures. Yet the payoff from such expenditures is often questionable at best. SIM Associates focuses its practice on creating profitable linkage between business strategy and technology investment, such that the value of technology investments yields real benefit in terms of corporate strategic value and bottom line results. 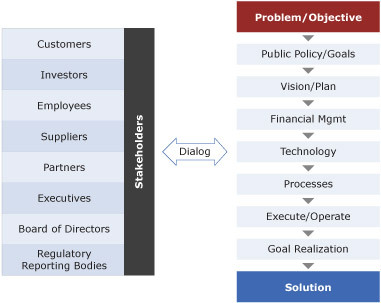 Senior management teams - CIOs working with CEOs, COOs and CFOs - need to create solutions that realize business strategies in a profitable and predictable manner. Each business objective links to a number of ‘layers’ of success. Those layers are depicted in the diagram to the right. We offer the full range of services tied to each layer of the diagram, ranging from business strategy and technology strategy development, financial quantification and justification of technology investments, technology realization, executive coaching, process engineering and operational realization of business plans and strategies.